One of the circular burial plots at Villa Maria before the cemetery relocation project. Nestled in the woods near Lake Pepin, between the Mississippi River and the Frontenac bluffs, is a 75-acre property called Villa Maria. For more than 130 years, the Ursuline Sisters, Catholic nuns dedicated to the education of girls and the care of the sick and needy, had a presence on the land educating and helping others to achieve spiritual and personal growth. Last spring, consistent with other efforts to consolidate and maximize resources, the Sisters closed the center and listed the property for sale. The Ursuline Sisters originally established Our Lady of the Lake girls’ school in Lake City and later expanded it to a boarding school, the Villa Maria Academy, at the present site. In 1969, lightning struck and destroyed the structure forcing the academy to close. For the next 45 years until June of last year, the Sisters established and sponsored an interfaith retreat and conference center. Among the peaceful woods, manicured lawns, and beautiful limestone structures at Villa Maria existed several out buildings and three, small, circular cemeteries. 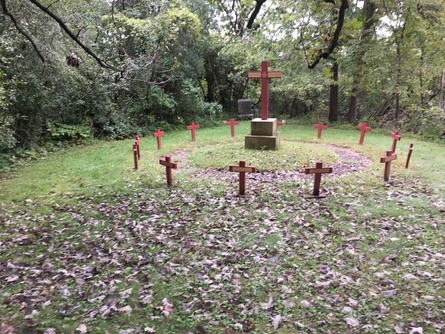 Buried on the sacred grounds were 51 individuals who had served Villa Maria in various capacities through the decades. Fifty-two crosses marked graves for priests, nuns, lay-people, housekeepers and even a husband and wife couple who had once been caretakers. Concerned about how future owners would care for the cemeteries and respect the decedents, Sister Ann Bartlet made the decision to move the graves to St. Mary’s Cemetery in Lake City. Because of their reputation for having worked on similar projects, Fawcett Junker Funeral Home in Winona, MN was hired to oversee the move. Licensed mortician and owner, Doug Penning visited Villa Maria last June and assessed the work. Penning and another licensed mortician from the same funeral home, Carrie McGhee, consulted Bartlet, obtained plots for each decedent, and worked with many professionals including the Goodhue County Attorney at each step. Goodhue granted the court order in September. Immediately, McGhee took responsibility for the disinterment and reinternment permits, inspecting work at the site, and working directly with the Office of Vital Records to amend death records to reflect the final burial site. The oldest grave dated back to 1881 and the most recent 2007. The earliest graves required special care because burial vaults weren’t commonly used until the 1940’s. According to McGhee, at times as many as 15 archeologists from the Milwaukee, WI firm, Commonwealth Heritage Group specializing in these types of projects, were on site to assure that the historic plots were carefully probed and all remains kept intact. Before they even disturbed the earth, the archeologists used GPS technology and photographed headstones and markers. For eight days in early October, they monitored the depth, color and texture of the soil to give precise guidance during the digging. “Gentle hand shoveling was required at times,” said McGhee, because “some of the burial containers had deteriorated and only skeletal remains were left. We accounted for everything including each rosary and assured that individuals were treated with dignity and respect,” said McGhee. During the week of the disinterments, Penning stayed on site and McGhee personally accompanied each decedent on their journey to St. Mary’s Cemetery. On October 13, the last of the 51 decedents were moved. One grave was simply a marker for an individual who had donated her body to science. Krista Bauer, Registration and Amendments Supervisor at OVR, worked closely with McGhee throughout the project. Because the Ursuline Sisters, like many nuns, changed their names, Bauer helped to connect the names on tombstones and markers with the legal death records on file. Bauer said OVR wasn’t able to amend records for all of the decedents because some were too old—pre-dating even Minnesota paper records, some weren’t Minnesota deaths, and some OVR just wasn’t able to locate a record with the information provided. “We were happy to be part of such an important and historic effort,” said Bauer. “I was proud we were successful in amending so many of the records so that future generations would have information about where these individuals are buried.” Bauer said that OVR amended 36 of the 52 death records.Click to edit this placeholder text. Did you know that there are five different types of U.S. passports? We are all familiar with the blue “regular” or “tourist” passport books, the most commonly issued U.S. passport. The U.S. Department of State also issues four other types of passports: Diplomatic, Official, Service, and No-Fee Regular. The Service passport is the newest, introduced on October 1, 2016. This passport, like the others, is evidence of U.S. citizenship and identity. The holder of a service passport must meet the same requirements needed to obtain any passport. See the Minnesota Department of Health Information for Local Issuance Offices website for an explanation of each of the types of U.S. passports. Passport applicants are already required to submit an original or certified copy of their evidence of citizenship. Applicants often use a certified copy of a U.S. birth certificate as evidence of citizenship. The applicant gets the original or certified copy back. In November 2016, the Department of State started requiring passport applicants to submit a photocopy or a second certified copy of their evidence of U.S. citizenship. If the evidence of citizenship is a birth certificate, the applicant needs to supply a photocopy of the certificate or a second certified copy. The photocopy or second certified copy remains with the documents submitted with the passport application. Although the Office of Vital Records has long advocated a “don’t’ copy a birth certificate” policy, it is okay to copy a birth certificate for passport application purposes. The passport applicant may make a copy of his/her own birth certificate or a local issuance office may make the copy and charge a non-vital records fee to the applicant. The Office of Vital Records and our information technology partners (MN.IT) continue to improve MR&C. On February 14, 2017, around 6 a.m., MN.IT will apply fixes to MR&C to address user reported issues. Interruption to service will be minimal. February 21, 2017, 8:15-9:45 a.m., OVR all staff meeting. Responses to voice and email messages will be made after 9:45 a.m.
February 16 and 23, 2017 - Death Registration training at the University of Minnesota Mortuary Science Program. March 9, 2017 - Birth Registration 101 for new birth registrars, noon - 4 p.m. The class is at the Minnesota Department of Health Freeman Bldg., 625 Robert St N, St. Paul, MN 55155-2538. Register by emailing health.MRCAdmin@state.mn.us. Include the name of the class in the subject line.